Sky lanterns or floating lights have today become a part of pop culture though their origin can be traced back to 3rdCentury BC. 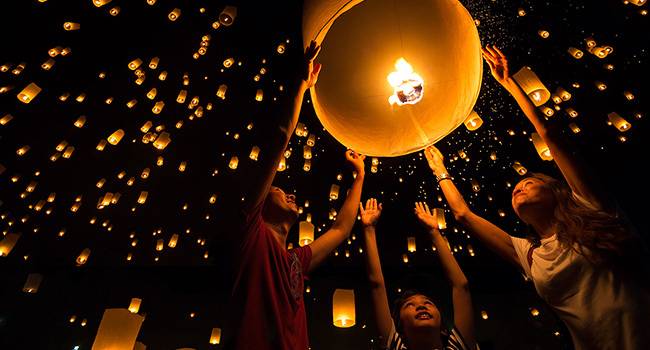 From battlefields to cultural ceremonies and wedding traditions to festive rituals, sky lanterns have been a part of many ceremonies across China, Thailand, Taiwan and the rest of Asia. During the Three Kingdoms Era, the sky lanterns were used on the battlefield to communicate with one another, and once peace settled the peasants and royalty used them to thank God for all the blessings, cast away fear and wish for a prosperous future. A wedding that is symbolic of newlyweds beginning a journey together often sees the couple light one lantern together and the wedding guests light others with personalized wishes for the couple’s future. In Thailand green lanterns are lit for personal growth and purple ones carry personalized wishes. In China, the final New Year celebrations is the Lantern Festival during which locals release Chinese New Year taboos. Be it prayers for good health, happy marriage, good harvest season or relief from worries; a sky lantern is believed to make wishes come true. It is believed that the longer and higher the sky lanterns float, the more likely the deities will receive your requests. The sky lantern ceremony has come to represent the releasing of one’s deepest fears and desires. It is a symbolic cleansing, a letting go of everything that troubles you. It is also the beginning of a new, enlightened you, with the light illuminating the path of knowledge and righteousness. This Palava Weekend, we will be celebrating the joy of Diwali with a sky lantern show on the 29th of October, 2016. Join in to count your blessings.